After this amazing quinoa salad in La Paz and the hundreds of other various dishes we had peppered with this food, this has quickly become my new favorite cereal in the world. I am ready to believe all the therapeutic virtues that people are willing to advertize. 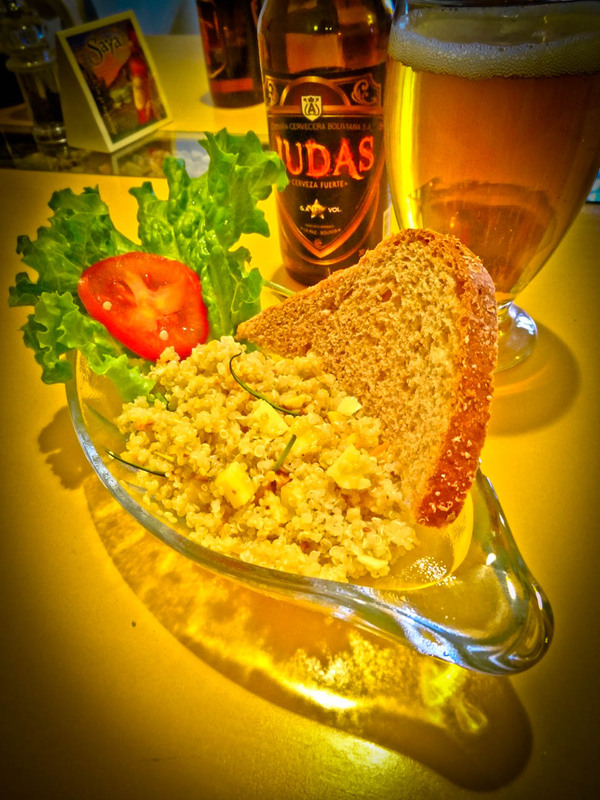 Just add some peanuts, queso fresco (fresh cheese), spinach and honey, sauce it up with a local catholic Bolivian brew called, er I don’t know, say “Judas” and I am a quinoa evangelist. Dont wish to state the obvious, but when traveling so much of the culture is shared via a destinations unique cuisine. So my advice would be go local, try the unique and memorable things as these are the things that will provide amazing memories,,, finding a certain coffee place in some way out place will not! Have amazing culinary travels and do your research.